Trafalgar recently hosted a fam trip for Canadian travel agents in France. 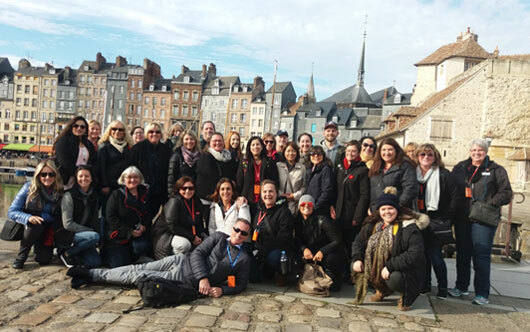 More than 31 agents and Trafalgar staff from across Canada joined Trafalgar on a seven-day customized The Treasures of France including Normandy trip, for a meaningful journey to some of the Second World War’s battlefields, memorial sites and more. The trip, which started and ended in Paris, was hosted by Anita Emilio, vice-president of sales for Trafalgar Canada. Participants joined Béatrice, the owner of a 17th-century French Château, L’Etape Gourmande, in Villandry for a three-course meal as part of Trafalgar’s “Be My Guest” experience.